auth_cas is used for Central Authentication Service (CAS). Every web2py application is a CAS provider and can optionally be a CAS consumer. Setting signature=True adds user and date stamping to auth tables, to track modifications. Auth has an optional secure=True argument, which will force authenticated pages to go over HTTPS. Note that doing this purely to avoid session overload on a busy site is not recommended because of the introduced security risk. Instead, see the Deployment chapter for advice on reducing session overheads. The password field of the db.auth_user table defaults to a CRYPT validator, which needs an hmac_key. On legacy web2py applications you may see an extra argument passed to the Auth constructor: hmac_key = Auth.get_or_create_key(). The latter is a function that read the HMAC key from a file "private/auth.key" within the application folder. If the file does not exist it creates a random hmac_key. If multiple apps share the same auth database, make sure they also use the same hmac_key. This is no longer necessary for new applications since passwords are salted with an individual random salt. register allows users to register. It is integrated with CAPTCHA, although this is disabled by default. This is also integrated with a client-side entropy calculator defined in "web2py.js". The calculator indicates the strength of the new password. You can use the IS_STRONG validator to prevent web2py from accepting weak passwords. impersonate allows a user to "impersonate" another user. This is important for debugging and for support purposes. request.args is the id of the user to be impersonated. This is only allowed if the logged in user has_permission('impersonate', db.auth_user, user_id). You can use auth.is_impersonating() to check is the current user is impersonating somebody else. auth.user contains a copy of the db.auth_user records for the current logged in user or None otherwise. There is also a auth.user_id which is the same as auth.user.id (i.e. the id of the current logger in user) or None. Similarly, auth.user_groups contains a dictionary where each key is the id of a group of with the current logged in user is member of, the value is the corresponding group role. The auth.requires_login() decorator as well as the other auth.requires_* decorators take an optional otherwise argument. It can be set to a string where to redirect the user if registration files or to a callable object. It is called if registration fails. The first line imports the new login method, the second line disables local registration, and the third line asks web2py to use the RPX login method. You must insert your own api_key provided by Janrain.com, the domain you choose upon registration and the external url of your login page. To obtain then login at janrain.com, then go to [Deployment][Application Settings]. On the right side there is the "Application Info", The api_key is called "API Key (Secret)". The domain is the "Application Domain" without leading "https://" and without the trailing ".rpxnow.com/" For example: if you have registered a website as "secure.mywebsite.org", Janrain turns it to the Application Domain "https://secure-mywebsite.rpxnow.com". Register with reCAPTCHA[recaptcha] V2 and obtain a (PUBLIC_KEY, PRIVATE_KEY) couple for your account. These are just two strings. reCAPTCHA may not work if you access the web site as 'localhost' or '127.0.0.1', because it is registered to work with publicly visible web sites only, unless you add them to the domains in the reCAPTCHA admin panel. There is an experimental argument, ajax=True, which uses the ajax API to recaptcha. It can be used with any recaptcha, but it was specifically added to allow recpatcha fields to work in LOAD forms (see Chapter 12 for more about LOAD, which allows web2py to 'plugin' components of a page with ajax ). It's experimental because it may be replaced with automatic detection of when ajax is required. More details: reCAPTCHA[recaptchagoogle] and configuration. If you do not want to use reCAPTCHA, look into the definition of the Recaptcha2 class in "gluon/tools.py", since it is easy to use other CAPTCHA systems. Note that Auth caches the logged in user in the session and that's what you get in auth.user, so you need to clear the sessions for the extra fields changes to be reflected in it. In that case, auth.signature will instead be defined when you call auth.define_tables(), by which point the custom tables names will already be set. 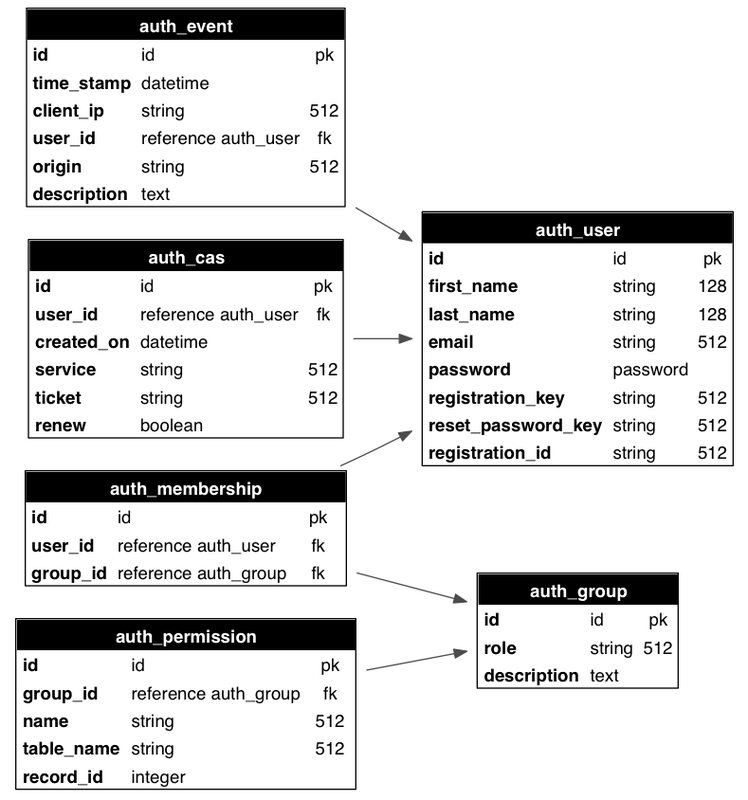 See the documentation of ldap_auth in web2py/gluon/contrib/login_methods/ldap_auth.py. We have previously discussed integration with Janrain, yet sometimes you do not want to rely on a third party service and you want to access a OAuth2.0 provider directly; for example, Facebook, Linkedin, Twitter, Google all of them provide an OAuth2.0 authentication service. web2py handles the OAuth2.0 flow transparently so that a user can be verified against any configured OAuth2.0 provider during login. Other than authentication an OAuth2.0 provider can grant to any web2py application access to user resources with restricted access thought a proprietary API. Google, Twitter, Facebook and so on, all have APIs that can be easily accessed by a web2py application. It must be underlined that OAuth2.0 is limited only to authentication and authorization (for instance CAS has more functionalities), this means that each OAuth2.0 provider has a different way to receive a unique id from their user database through one of their APIs. Specific methods are well explained on respective provider documentation, they usually consist in a very simple REST call. This is why for each OAuth2.0 provider there is the need to write a few lines of code. Before writing any instructions in the application model a first step is needed for any provider: registering a new application; this is usually done on provider's site and is explained in provider's documentation. There are a few things that needs to be known once there is the need to add a new OAuth2.0 provider to your application: 1. the Authorization URI; 2. the Token request URI; 3. the application identification token and secret received upon registration of the new application; 4. the permissions that the provider must grant to the web2py application, i.e. the "scope" (see the provider's documentation); 5. the API call to receive a UID of the authenticating user, as explained on providers documentation. Point 1 to 4 are used to initialize the authorization endpoint used by web2py to communicate with the OAuth2.0 provider. The unique id is retrieved by web2py with a call to the get_user() method when needed during the login flow; this is where the API call of point 5 is needed. Once the class is instantiated, and the user is authenticated, the web2py application can access the API of the provider any time by using the OAuth2.0 access token by calling the accessToken() method of that class. What follows is an example of what can be used with Facebook. This is a basic example using Facebook Graph API, remind that, by writing a proper get_user() method, many different things can be done. The example shows how the OAuth2.0 access token can be used when calling the remote API of the provider. ## Define oauth application id and secret. '''Returns the user using the Graph API. This tells web2py to create an archive table for each of the tables in db and store a copy of each record when modified. The old copy is stored. The new copy is not. archive_db allows to specify another database where the archive tables are to be stored. Setting it to None is the same as setting it to db. archive_names provides a pattern for naming each archive table. current_record specified the name of the reference field to be used in the archive table to refer to the original, unmodified, record. Notice that archive_db!=db then the reference field is just an integer field since cross database references are not possible. Only tables with modified_by and modified_on fields (as created for example by auth.signature) will be archived. When you enable_record_versioning, if records have an is_active field (also created by auth.signature), records will never be deleted but they will be marked with is_active=False. In fact, enable_record_versioning adds a common_filter to every versioned table that filters out records with is_active=False so they essentially become invisible. If you enable_record_versioning, you should not use auth.archive or crud.archive else you will end up with duplicate records. Those functions do explicitly what enable_record_versioning does automatically and they will be deprecated. In the two auth.messages above, you may need to replace the URL portion of the string with the proper complete URL of the action. This is necessary because web2py may be installed behind a proxy, and it cannot determine its own public URLs with absolute certainty. The above examples (which are the default values) should, however, work in most cases. Two-step verification (or Two-factor authentication) is a way of improving authentication security. The setting adds an extra step in the login process. In the first step, users are shown the standard username/password form. If they successfully pass this challenge by submitting the correct username and password, and two-factor authentication is enabled for the user, the server will present a second form before logging them in. This case is a good example for apps where users can enable/disable two-factor authentication by them self. This form will ask users for a six-digit code that has been emailed to their accounts (the server emails the code if the username and password was correct). By default the user will 3 attempts to introduce the code. If the code is incorrect after 3 attempts, the second verification step is treated as having failed and the user must complete the first challenge (username/password) again. Create a group (also known as a role) for the two-step verification. In this example it will be called auth2step and the description may be Two-step verification. Give a user membership of this role. auth.messages.two_factor_comment = "Your code have been sent by SMS"
user: it is a row with all his parameters. You can access them: user.email, user.first_name, etc. auth_two_factor: string that contains the authentication code. auth_two_factor = #write your own  algorithm to generate the code. Initialize a secret key shaking your phone. 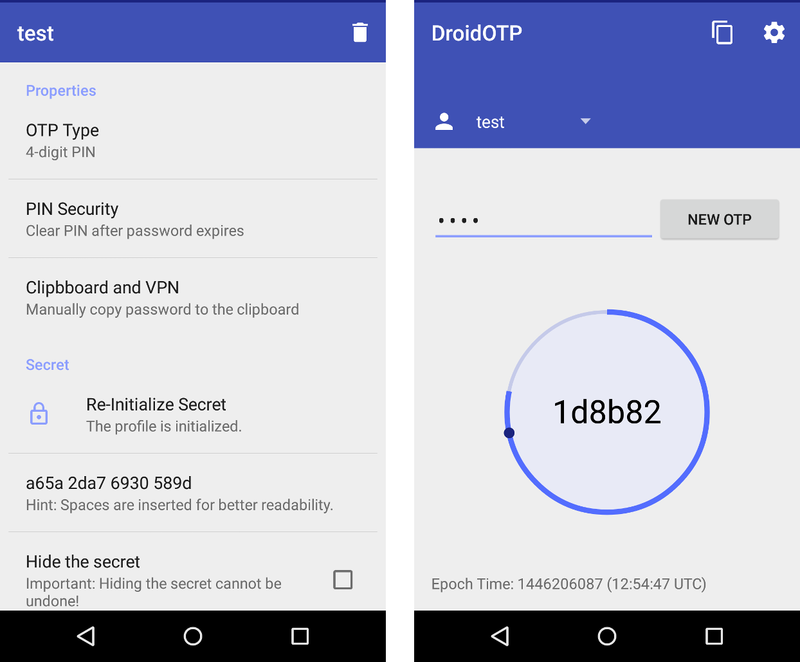 The secret key generated before with your phone need to be introduced into motp_secret field. The secret should be not reused, for security reasons. Choose one PIN. It can be numbers, letters or a mix. Go to your phone, choose your profile and type the PIN you have introduced before in the form. You got the authenticator code to use in your app!! Note that for this way of two-factor authentication phone and server (where web2py app is hosted) need to be synchronized (on time). They can be in a different time zone. This is because the OTP use Unix time stamp. It tracks the time as a running total of seconds. It store a template for the name of the group created for user id. Users have membership in groups. Each group is identified by a name/role. Groups have permissions. Users have permissions because of the groups they belong to. By default each user is made member of their own group. to make any new user automatically member of group number 5. Here 5 is used as an example and we assume the group was created already. NOTE: To avoid database query at each page load that use auth.has_membership, someone can use cached=True. If cached is set to True has_membership() check group_id or role only against auth.user_groups variable which is populated properly only at login time. This means that if an user membership change during a given session the user has to log off and log in again in order to auth.user_groups to be properly recreated and reflecting the user membership modification. There is one exception to this log off and log in process which is in case that the user change his own membership, in this case auth.user_groups can be properly update for the actual connected user because web2py has access to the proper session user_groups variable. To make use of this exception someone has to place an "auth.update_groups()" instruction in his app code to force auth.user_groups to be updated. As mention this will only work if it the user itself that change it membership not if another user, let say an administrator, change someone else's membership. gives permission "name" (user defined) on the object "object" (also user defined) to members of the group group_id. If "object" is a tablename then the permission can refer to the entire table by setting record_id to a value of zero, or the permission can refer to a specific record by specifying a record_id value greater than zero. When giving permissions on tables, it is common to use a permission name in the set ('create', 'read', 'update', 'delete', 'select') since these permissions are understood and can be enforced by the CRUD APIs. @auth.requires also takes an optional argument requires_login which defaults to True. If set to False, it does not require login before evaluating the condition as true/false. The condition can be a boolean value or a function evaluating to boolean. The attribute authorize of upload field can be None (the default) or a function that decides whether the user is logged in and has permission to 'read' the current record. In this example, there is no restriction on downloading images linked by the "small_image" field, but we require access control on images linked by the "large_image" field. The concept allows different management settings, each of which allows a user group to edit a certain set of tables in this application. Example: First, create a group (also known as a role) for your privileged users. In this example, it will be called admin. Give a user membership of this role. Second, think of a name to describe this management setting, such as db_admin. 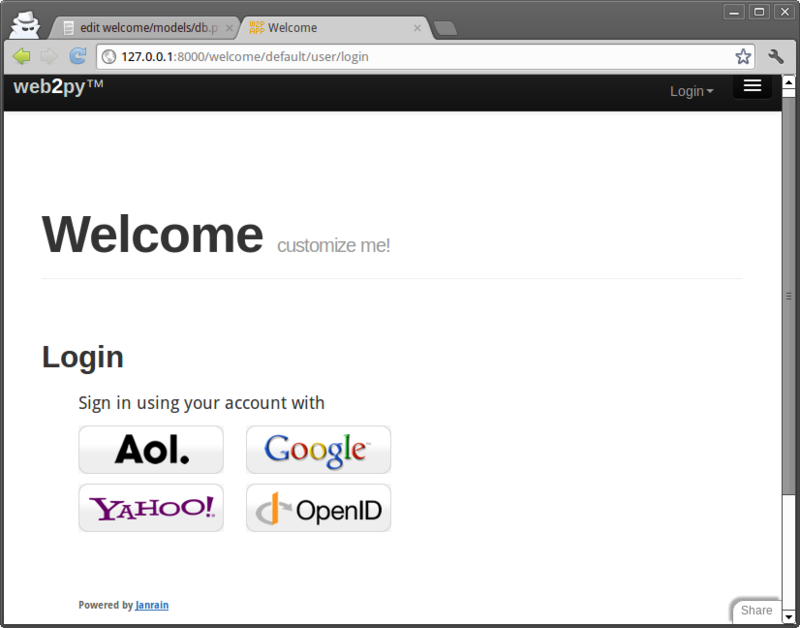 This URL appears as /appadmin/manage/auth. This mechanism allows multiple management settings; each additional management setting is just another key defined in auth.settings.manager_actions. For example, you may want a group of users (such as 'Super') to have access to every table in a management setting called "db_admin", and another group (such as 'Content Manager') to have admin access to tables relating to content in a management setting called "content_admin". The management setting called "content_mgr_group_v2" shows some more advanced possibilities. The key smartgrid_args is passed to the smartgrid used to edit or view the tables. Apart from the special key DEFAULT, table names are passed as keys (such as the table called "comments"). The syntax in this example names the tables as a list of strings, using the key db=content_db to specify the database. Where it was set to something like "sha512:a-pass-phrase" and passed to the CRYPT validator for the "password" field of the auth_user table, providing the algorithm and a-pass-phrase used to hash the passwords. However, web2py no longers needs this setting because it handles this automatically. If the default behavior is left unchanged, auth.navbar uses the _next URL parameter, and uses that to send the user back to the referring page. However, if navbar's default auto-referring behavior is changed, the settings below will take effect.